Part of what makes an English springer spaniel such a much beloved family dog and hunting buddy is it’s innate ability to raise our spirits. With a springer by your side, even a bad day seems less bad. Springers, by their nature, tend to be receptive to human emotions - perhaps more so than some of the other breeds of dogs. And springers often key off our emotions... both positive and negative. Anger is always counter-productive when training a dog. 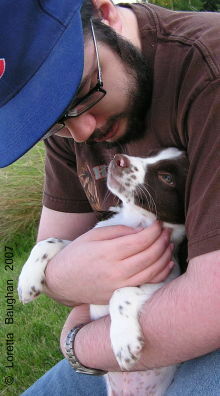 When training Trixie, our first field bred English springer spaniel, my husband quickly learned to cultivate patience and avoid anger. If he became irritated during training, Trixie would simply turn her back to my husband and totally ignore him because she didn’t like his tone of voice. It was as if she was telling him, "Talk nicely or don’t bother." Nervousness can be contagious. A field trialer, who has a well trained dog, gets a bad case of nerves the day of the trial. His dog picks up on this and seems to forget just about everything he’s practiced in training. Unfortunately, its performance suffers. Excitement energizes the dog. What hunter doesn’t look forward to bird hunting season with an excitement reminiscent of childhood Christmases? The springer can smell it in the air and senses the hunter’s anticipation... even before he gets out the shotgun and puts on the blaze orange. "The spaniel - especially the soft spaniel - needs to be nurtured if he is to flourish. It’s not so much a process of "training" as it is of "developing" him into a gun dog." Like people, some springers are more sensitive than others - and this can be attributed to their individual temperament or personality. Dogs are pack animals. If the breeder has spent an adequate amount of time observing a litter of pups and is aware of what to be looking for, the leader of the pack can usually be readily identified by it's personality traits. The pack leader pup will carry his tail high, while lesser ranking pups’ tails will be held lower, especially when encountering the leader. Often the pack leader pup can be described as bold or independent. 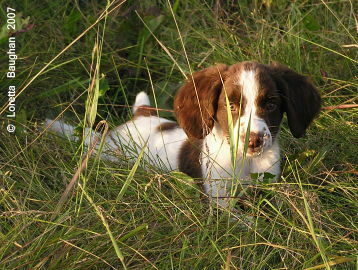 The most laid back of the pups may also be a tenderhearted spaniel, which is generally referred to as being "soft". Because of it's soft temperament, this pup will usually avoid confrontations with it’s littermates, approaches new people or situations with caution and may be lacking in self-confidence. The remainder of the puppies will fall somewhere in between with some that may also be soft, but to lesser degrees. When selecting a pup from a litter, trying to assess personality traits during a brief visit can be misleading. If, for instance, the pups are tired, it’s unlikely that you will get an accurate assessment without relying on the breeder for advice. Understanding and recognizing the pup’s temperament and personality, then matching it to the owner’s lifestyle, makes for the most successful placement. Just as not every trainer is capable of handling the bold independent dog, not every trainer is suited to working the soft dog. But with understanding, patience and given time to mature and build confidence, the soft dog can become an exceptional hunting buddy. 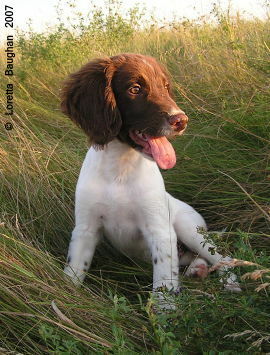 Soft springers are often quite intelligent and are not hard-headed. They respond well to the soft spoken person. A big plus for the soft dog is that once they learn something, generally, it is learned for life. First, we need to rethink the idea of "training". Did you ever take piano lessons when you were young? I did. I began weekly piano lessons when I was just five years old with Mrs. Athern. I practiced every day. It was fun. I enjoyed it and progressed quickly. The elderly Methodist Church pianist, who was my teacher, eventually retired from giving lessons and my parents found a new teacher. My second piano teacher was stern and she was a stickler for repetitive drills. I remember being told that much of everything I’d been doing was "wrong" and she added insult to injury by demoting me back to a lower level book. The thrill was gone. I no longer felt the light hearted pleasure that playing the piano had given me. Daily practice soon became a dreaded chore. Dear Mrs. Athern’s style was to nurture and develop her students abilities in a cheerful, grandmotherly way. She kept learning fun as she rewarded her pupils progress with heartfelt praise... and little foil star stickers. Mrs. Athern taught through positive motivation. In contrast, my second teacher taught in a more regimented fashion and was sparing with words of praise. In short order, she managed to tear down my self-confidence and snuffed out my enthusiasm to play the piano. Her method was more based on nitpicking and focusing on the negative. "If your dog is from good hunting stock, the desire and natural hunting ability should be in the genes. You only need to guide him in the right direction and provide him with opportunity." The spaniel - especially the soft spaniel - needs to be nurtured if he is to flourish. It’s not so much a process of "training" as it is of "developing" him into a gun dog. Provide him with the opportunity to learn by discovery and you’ll build up his confidence. Always utilize positive motivation. When you first bring a new pup home, concentrate on bonding with the pup as he makes the adjustment to his new life. Don’t rush it. Give him plenty of time, attention and love. Perhaps the most evident difference in developing a bold pup versus a soft one is that the soft dog does not take correction well. A stern reprimand is adequate to effect the correction. But gruff or harsh treatment will cause the soft dog to shut down. In some cases, this type of poor treatment from a trainer lacking in understanding can destroy what confidence the dog had and even ruin the dog. Some soft dogs with a very gentle nature tend to have "butter mouth" - which means they carry birds or dummies so softly that they often slip out of their mouth. Usually, with some experience and maturity, they outgrow this problem on their own. Throw out the books that advocate a regimented training plan. The notion of training a pup - any pup - to retrieve morning, noon and night, seven days a week is ludicrous. If you adhere to a rigid regimented plan, you’ll run the risk of training the joy of working out of your springer. Limit retrieving, especially when he is a very small puppy to just one or two tosses and no more than once or twice a week. If your dog is from good hunting stock, the desire and natural hunting ability should be in the genes. You only need to guide him in the right direction and provide him with opportunity. The idea of introducing a young pup to retrieving a sock or other object in a hallway may work fine for some, but it never has for me. Inevitably, when I have tried this method, after just one or two tosses, the pup decides that he can avoid bringing it back to me by just laying down. So pup has learned to avoid bringing the retrieve in - even before we get outdoors! When I am ready to introduce young, six week old pups to retrieving, I toss a fresh, paint roller cover or small puppy dummy in the yard then bring out the pup for a walk. I may steer him towards the object, but I otherwise ignore it. My purpose is to get the pup to discover the object for himself, figure out how to pick it up and carry it - or drag it, as the case may be. I want to spark the pup’s natural instinct to retrieve, not force him to do so. Some pups will pick up the object the very first time, others may be more interested in exploring or focused on smelling at that time, so I don’t make an issue of it. Eventually, they do make the discovery… in their own time. It is important to use a new paint roller cover or tennis ball or dummy for each pup so that they are not put off by the scent of another pup or dog on the object. This is particularly important in the case of the soft pup. When the young pup does begin to discover retrieving and picks up the object, I do not insist that he give it to me. The pup is excited and proud of himself as he carries it around. I sit right down on the ground so as not to intimidate the pup and encourage him to come and show me what he has found. Usually, the pup will come and climb into my lap. Still, I do not take the object away, but rather, I praise him and allow him to continue to hold it, if he wishes to do so. The point, at this stage, is to let the pup carry the retrieve to his heart’s content. He needs to figure out how much fun it is to carry and realize that when the time comes to bring it to me, giving it to me does not mean the end of the fun. When pup is a little older and you take him outside to do some retrieving, be sure not to do it in the yard or anywhere near the house - especially if there is another dog in the household. The other dog’s scent around the yard could shake the springer's confidence in retrieving or cause him to want to run off with the dummy. By going out to a field, away from the house, you minimize distractions and the springer will be better able to focus on the task at hand. Keep it fun and offer plenty of deserved praise. Aways keep him within gun range whether you are working the dog or just out for a fun walk. After you are in the field, pull the dummy out for three fun retrieves. And two or three times a week is plenty. Afterwards, find a spot to sit and encourage the dog to sit close... but resist the urge to grab. (Never grab at the dummy or dog when it is retrieving as this can create delivery problems.) If, at first, the dog doesn't want to sit close, don't press the issue. Give him some time and before long, it will be sitting next to you or in your lap. This will build confidence in the dog and help encourage it to come in nicely when delivering birds. The key to training a dog - any dog - is to avoid creating problems. Teach one thing at a time, keep it fun and have patience. The soft dog is a great choice for the right person or family situation. They make a gentle, devoted family dog and an intelligent, eager to please hunting buddy. What more can you ask for? Loretta Baughan is the founder, editor and publisher of Spaniel Journal. She is an award winning professional photographer, webdesigner and owner of the Autumnskye, LLC kennel. 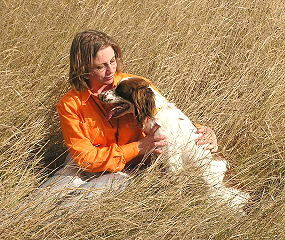 She raises, trains and hunts her English springer spaniels. Loretta resides in northern Wisconsin, with her husband, Steve, and their three children.